I love Susan Mallery! She never disappoints! Her books always end with a happy ending and always leave me in a great mood when done reading. I really enjoyed Only Us, and I think everyone sixteen and over can read and enjoy it too. It has just the right amount of romance without crossing the line. Only Us has great characters that you can relate too and will instantly fall in love with. Cameron’s daughter is a very smart girl and many parts throughout the story she made me laugh out loud. Cameron and Corina were too stubborn and blind, and it took a little girl to open their eyes. I loved it! 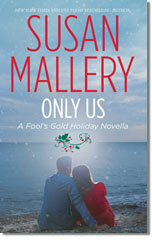 One of my favorite things about Susan Mallery’s books is that she doesn’t just focus on the romance; she also touches different subjects such as marriage, loss, friends, family, etc. So to me this makes the story a little more believable and very easy for me to put myself inside the shoes of her characters. There hasn’t been one book by her that I did not enjoy. So if you’re looking for a short, and well put together story that ends happy, definitely get your copy of Only Us! You'll love it! I have this e-book and now after reading your review I think I will have to bump it up on my to be read pile....^_^. This sounds like a good read for when I'm looking for a break in my usual reading and looking for a happy ending. Thanks for the review. Always love Susan Mallery! I'll have to get this one too. Thanks, Damaris! I'd heard about this one elsewhere too. Need to check into it!